Do you have missing teeth? Are you looking for an alternative to traditional dentures, bridges, or partial dentures? Dental implants with our Rocky River dentist may just be the perfect solution. At John L. Kinsley, DDS General & Restorative Dentistry, our implants offer you the opportunity to replace missing teeth without altering the health or integrity of your natural smile. The longer you go with a gap or space in your smile, the greater risk of tooth misalignment and bone loss you’ll have to endure. Replacing your missing teeth as quickly as possible can help you boost your overall oral health and smile aesthetics. There is no other type of restorative treatment in modern dentistry that can last as long as the dental implant. In fact, over 98% of implant treatments last for the entire life of the patient. Your investment in these artificial tooth roots allows you to avoid repetitive treatments and expenses as other types of prosthesis wear out. Rather than wear a set of bulky, removable dentures, you might decide to anchor them in place with dental implants. Implant dentures come in a variety of styles, some of which are removable (snap in and out) or a slimmer extended bridge that is permanently anchored into place. The type you choose will depend on your oral health, long term goals, and budget. 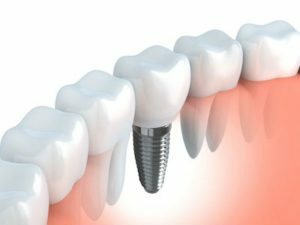 For single or multiple tooth replacement, implants are the perfect choice. Their strength and integrity allows us to replace single teeth with an independent implant and crown, or three or four teeth with as few as two implants. For most of our patients, the dental implant process requires a few different appointments spread over the course of three to six months. 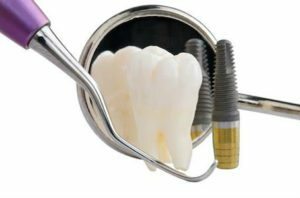 After the initial surgery is performed, we allow the implant site to heal and new bone to grow around it. Once that happens, Dr. Kinsley will uncover the artificial roots and then restore them with a crown, bridge, or denture. Between these phases of treatment, we can provide you with a temporary tooth replacement option so you can continue smiling or eating without discomfort or embarrassment. The strength and integrity of implants allow your new smile to look and feel closer to real teeth than any other modern dental treatment. In fact, they’re now regarded to be the gold standard of tooth replacement in everyday oral health care. Are implants the right solution for you? Call John L. Kinsley, DDS General & Restorative Dentistry in Rocky River today to schedule an exam. Our treatment coordinators will be happy to review financing options that are available. When it comes to improving what your teeth look like, John L. Kinsley, DDS General & Restorative Dentistry offers a variety of cosmetic dental treatments for you to choose from.